Conveniently located in Fitchburg’s Harlan Hills neighborhood, just off Seminole Hwy., 3105 Kirkwall is a traditional home that somehow manages to look both grand and homey. The first thing you’ll notice about this 3,200-sq-ft. home is the striking reddish brick exterior and its many gridded windows. A decorative copper window awning to the left of the front door provides a unique accent. And Inside, a split-bedroom design makes this 5-bedroom, 4-bath house perfect for multi-generational or extended family living. The 2-story front entry, with its greige painted walls, is bright and welcoming. The millwork throughout is exceptional quality — and that’s immediately evident in the beautiful maple flooring and the chunky maple banister and railing leading to the 2nd floor. To the right, there’s a combination den and music room with French doors that would make a perfect office. 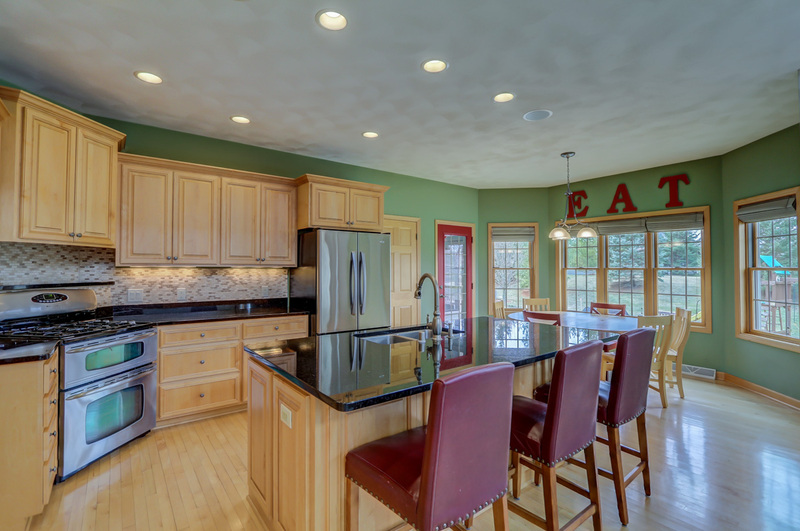 On the left, you’ll find a formal dining room where you can entertain family or friends. And an attached butler’s pantry is great for storing dishes and glassware — and mixing drinks, of course. 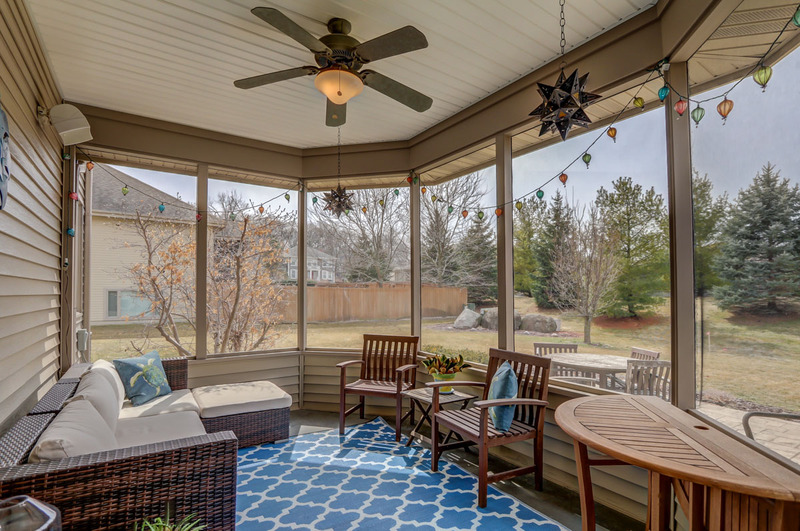 A short walk straight from the front entry will put you in the spacious great room, with its vaulted ceilings. Natural daylight filters in through the large windows, giving the room a cheerful feel. 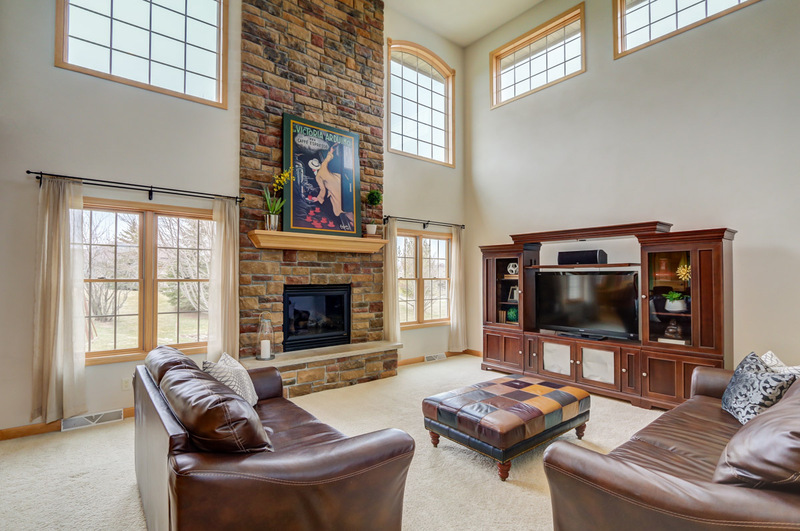 The focal point is a gas fireplace, surrounded by floor to ceiling stonework. An open concept between the great room and eat-in kitchen makes this the ideal spot for entertaining or spending time with family. The kitchen features beautiful maple cabinets and black granite countertops. You can pull up a stool for a snack at the island breakfast bar — or settle in in for a meal in front of the kitchen windows, where there’s plenty of room for your table and chairs. A walk-in pantry and pantry cabinet offer lots of kitchen storage. Back inside, a short hallway leads from the kitchen to a new large extended mudroom just off the garage — complete with built-in shelving and hooks for storage and easy access to jackets, shoes and backpacks! The attached 2+ car garage offers more than enough room for a couple of cars as well as storage. Continuing down the back hallway past a large closet, you’ll find the 1 main-level bedroom at the end of the hall — right next to a 3/4-bath with new wood-look tile flooring, walk-in shower and large linen closet. This is a perfect location for extended family, teenager or guests. Upstairs, you’ll find a spacious master bedroom with large his-and-her walk-in closets with built-in shelving. The gray walls and maple crown molding give the bedroom a cozy elegance. There’s an attached master bath with separate sinks, spa tub, walk-in shower with a corner seat and dual shower heads (1 with a rain head), and handy linen closet, making the room both relaxing and efficient. There are 2 more bedrooms upstairs, both with large walk-in closets. The 2 share a full hallway bath with a double sink, maple cabinetry, linen closet and a pocket door that separates the sink from the shower. And for ease in doing the family laundry, there’s a 2nd floor laundry room, with a sink, cupboards, and hanging rod. The partially-finished lower level is where you’ll find the 5th (finished) bedroom with its large closet and attached 3/4-bath with shower. This bedroom suite has double access — from both the hallway at the bottom of the stairs and the currently-unfinished storage area. In the mechanical room, you’ll find 2-zone heating, an April Air humidifier and air cleaner, and built-in workbench. With most of the lower level unfinished, you can take advantage of the large open space — ready to finish into a work-out room, family room, kids’ playroom or craft room. The 8+ ft. ceilings and large windows brighten up this lower level space. And finally, you’ll love the location between Seminole Hwy and Fish Hatchery Rd., between the Beltline and Hwy. PD. The many nearby restaurants, grocery stores, bike paths, and Fitchburg Library, are just a few of the things that make this a great place to live.